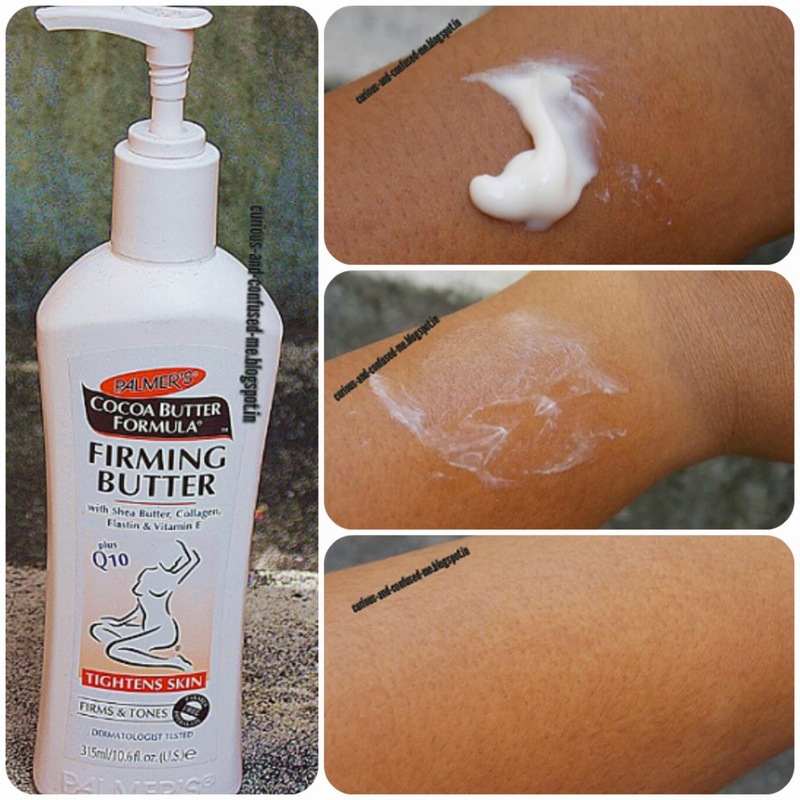 Posted on October 9, 2014 by Swathi Bhat wrote in firming, moisturizer., Palmers Cocoa Butter, skincare. It has 4 Comments. I keep seeing the press release of Palmers Cocoa Butter Formula Firming Butter in some blogs. I was like ” Hey, I have this”. Then it hit me why don’t I review this. Product says visible results within 6 weeks. But I have been using this from just 2 and half weeks so I’ll be just sharing the First impression of this. I go to gym 6 days a week. I am slowly turning into Gym rat Lol. Anyhoo, around 6 weeks ago my inch loss stopped, but weight loss continued. Which is not good. Even my trainer was concerned about it. I felt that skin near my thighs where quite loose. Not saggy but not normal. I know I am not good at explaining, but I guess you all understood. I figured out that skin needs some help externally. Started my re-search, ended up with this. Something about my skin : It needs minimum mosturization. Plus I live in a humid city, so even a teeny bit more lotion/cream results in chipku skin. – There is huge improvement in skin within 2.5 weeks. It does firm the skin. – The butter is thick liquid. Reviews I read says that the skin will absorb the butter in no time. But I feel the massaging is required. Even the company says so. Best way is to take 2 drops at time and massage it gently specially on thighs, tummy, bust, arms and your bu** too 😛 . – Massaging the butter is time consuming and needs patience. But it’s for skin and it’s worth it. -I lost 2 cm in my arms and 1 cm in tummy area. Nothing major but when you are on weight loss journey, it matters. I cant say it is only due to this butter, but this does help in toning. – Smells heavenly, like a chocolate factory. Personally I like eating chocolate not smelling like one. Despite that I love the smell. I use it twice, after the shower, before zzzzing. Smell lingers for a long time. -I think the smell calms and soothes the senses. I was having mild headache in the night, after applying the butter I was able to sleep peacefully. – Moisturising properties are amazing. Once the skin absorbs the product, skin looks healthy moisturised. – It Costs 520INR for 315ml. Which is Okay. Looking at the rates these days anything under 500INR or hovering over 500INR is affordable according to me. – Hygienic packaging. The pump dispenser is effective in controlling the product. this seems to be a super cool product. if it helps in toning, then it's really great. btw does it contains paraben? Something I learnt after the blunders and some I observed…	My first haul post….